Railpictures.ca - James Knott Photo: Lake Huron was certainly calling the shots today in terms of the weather on the Goderich and Exeter Subs. One minute, it would be sunny with blue skies, the next it would be totally clouded over and snowing, and the next it would be cloudy to the north with strong sun at the south. When 581 reached Hensall, it was the latter. Today, GEXR ran west from Stratford with five hoppers, dropping them at Broadgrain Commodities east of Seaforth. From there, there ran light power to Clinton Jct where they then took the Exeter Sub continuing light to Hensall. Pictured here, they are lifting one boxcar in Hensall that would be taken to Exeter. From here, they continued the journey south to Exeter and switched out this boxcar for another and headed back towards Clinton. Seemed like an awful lot of work to swap out one boxcar for another. It’s roughly 60 miles round trip from Broadgrain to Exeter, and the Exeter Sub is slow going – especially with all of the snow drifts. With wages and fuel, it was hard to make sense of this one. | Railpictures.ca – Canadian Railway Photography – photographie ferroviaire Canadienne. Caption: Lake Huron was certainly calling the shots today in terms of the weather on the Goderich and Exeter Subs. One minute, it would be sunny with blue skies, the next it would be totally clouded over and snowing, and the next it would be cloudy to the north with strong sun at the south. When 581 reached Hensall, it was the latter. 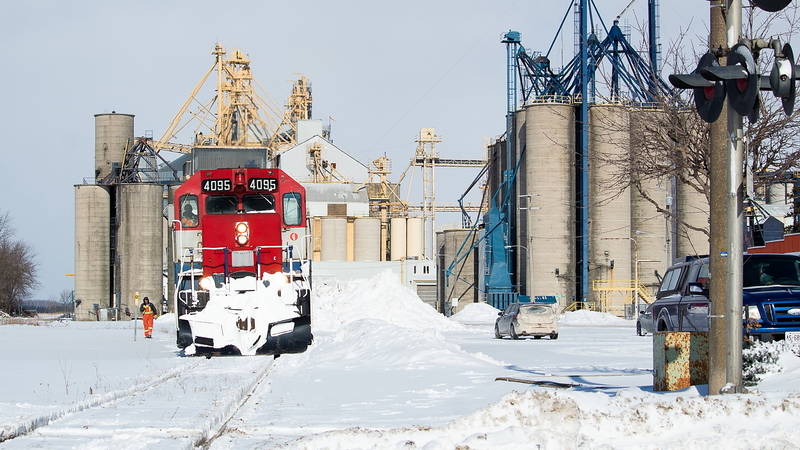 Today, GEXR ran west from Stratford with five hoppers, dropping them at Broadgrain Commodities east of Seaforth. From there, there ran light power to Clinton Jct where they then took the Exeter Sub continuing light to Hensall. Pictured here, they are lifting one boxcar in Hensall that would be taken to Exeter. From here, they continued the journey south to Exeter and switched out this boxcar for another and headed back towards Clinton. Seemed like an awful lot of work to swap out one boxcar for another. It's roughly 60 miles round trip from Broadgrain to Exeter, and the Exeter Sub is slow going - especially with all of the snow drifts. With wages and fuel, it was hard to make sense of this one. Thanks Jason too! Sorry,I missed that comment come in. Thanks Craig!! This was one I’d wanted for a while and when it used to be a Wednesday run, I also kind of doubted I’d ever get it. Was a very cool chase. I have another shot at Hensall from Saturday that has grown on me more than this one since posting. Maybe I’ll share it too one day. I browsed some of your shots today. We’ve definitely got similar tastes in terms of destinations! Nice shot, Jamie, and another “off the beaten path” location! Great shot James and nice detailed report from the day.